It also reveals a critical and gaping hole in the political debate in Britain. Because what is happening in America and what is happening in Britain are entwined. Brexit and Trump are entwined. The Trump administration’s links to Russia and Britain are entwined. 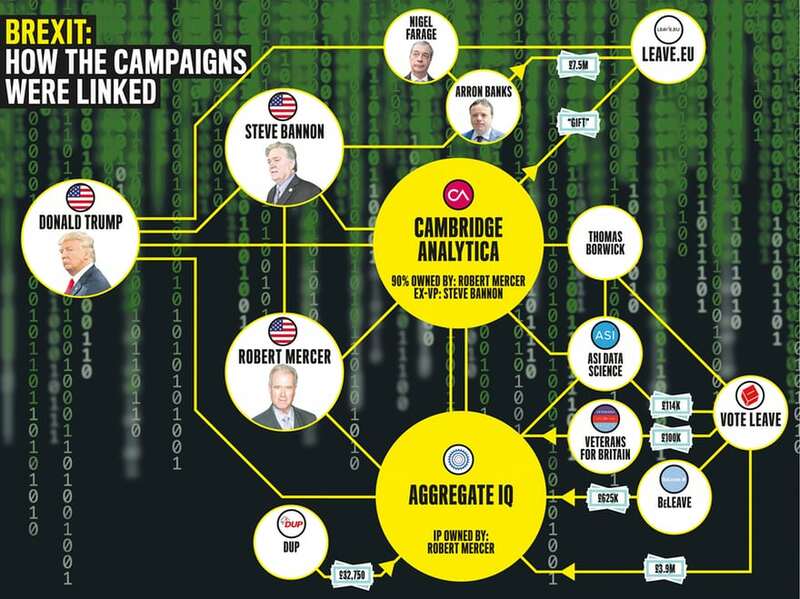 And Cambridge Analytica is one point of focus through which we can see all these relationships in play; it also reveals the elephant in the room as we hurtle into a general election: Britain tying its future to an America that is being remade – in a radical and alarming way – by Trump. A leading QC who spends a lot of time in the investigatory powers tribunal said that the problem with this technology was that it all depended on whose hands it was in. In Britain, we still trust our government. We respect our authorities to uphold our laws. We trust the rule of law. We believe we live in a free and fair democracy. Which is what, I believe, makes the last part of this story so profoundly unsettling. The details of the Trinidad project finally unlocked the mystery that was AggregateIQ. Trinidad was SCL’s first project using big data for micro-targeting before the firm was acquired by Mercer. It was the model that Mercer was buying into. And it brought together all the players: the Cambridge psychologist Aleksandr Kogan, AggregateIQ, Chris Wylie, and two other individuals who would play a role in this story: Mark Gettleson, a focus group expert who had previously worked for the Lib Dems. And Thomas Borwick, the son of Victoria Borwick, the Conservative MP for Kensington. When my article linking Mercer and Leave.EU was published in February, no one was more upset about it than former Tory adviser Dominic Cummings, the campaign strategist for Vote Leave. He launched an irate Twitter tirade. The piece was “full of errors & itself spreads disinformation” “CA had ~0% role in Brexit referendum”. A week later the Observer revealed AggregateIQ’s possible link to Cambridge Analytica. Cummings’s Twitter feed went quiet. He didn’t return my messages or my emails. Questions had already been swirling about whether there had been any coordination between the Leave campaigns. In the week before the referendum, Vote Leave donated money to two other Leave groups – £625,000 to BeLeave, run by fashion student Darren Grimes, and £100,000 to Veterans for Britain, who both then spent this money with AggregateIQ. The Electoral Commission has written to AggregateIQ. A source close to the investigation said that AggregateIQ responded by saying it had signed a non-disclosure agreement. And since it was outside British jurisdiction, that was the end of it. Vote Leave refers to this as the Electoral Commission giving it “a clean bill of health”. On his blog, Dominic Cummings has written thousands of words about the referendum campaign. What is missing is any details about his data scientists. He “hired physicists” is all he’ll say. In the books on Brexit, other members of the team talk about “Dom’s astrophysicists”, who he kept “a tightly guarded secret”. They built models, using data “scraped” off Facebook. Finally, after weeks of messages, he sent me an email. We were agreed on one thing, it turned out. He wrote: “The law/regulatory agencies are such a joke the reality is that anybody who wanted to cheat the law could do it easily without people realising.” But, he says, “by encouraging people to focus on non-stories like Mercer’s nonexistent role in the referendum you are obscuring these important issues”. The most unfortunate aspect of this – for Dominic Cummings – is that this isn’t credible. It’s the work of moments to put a date filter on Google search and discover that in late 2015 or early 2016, there are no Google hits for “Aggregate IQ”. There is no press coverage. No random mentions. It doesn’t even throw up its website. I have caught Dominic Cummings in what appears to be an alternative fact. But what is an actual fact is that Gettleson and Borwick, both previously consultants for SCL and Cambridge Analytica, were both core members of the Vote Leave team. They’re both in the official Vote Leave documents lodged with the Electoral Commission, though they coyly describe their previous work for SCL/Cambridge Analytica as “micro-targeting in Antigua and Trinidad” and “direct communications for several PACs, Senate and Governor campaigns”. And Borwick wasn’t just any member of the team. He was Vote Leave’s chief technology officer. Cummings won’t say who did his modelling. But invoices lodged with the Electoral Commission show payments to a company called Advanced Skills Institute. It takes me weeks to spot the significance of this because the company is usually referred to as ASI Data Science, a company that has a revolving cast of data scientists who have gone on to work with Cambridge Analytica and vice versa. There are videos of ASI data scientists presenting Cambridge Analytica personality models and pages for events the two companies have jointly hosted. ASI told the Observer it had no formal relationship with Cambridge Analytica. This story isn’t about cunning Dominic Cummings finding a few loopholes in the Electoral Commission’s rules. Finding a way to spend an extra million quid here. Or (as the Observer has also discovered )underdeclaring the costs of his physicists on the spending returns by £43,000. This story is not even about what appears to be covert coordination between Vote Leave and Leave.EU in their use of AggregateIQ and Cambridge Analytica. It’s about how a motivated US billionaire – Mercer and his chief ideologue, Bannon – helped to bring about the biggest constitutional change to Britain in a century. Because to understand where and how Brexit is connected to Trump, it’s right here. These relationships, which thread through the middle of Cambridge Analytica, are the result of a transatlantic partnership that stretches back years. Nigel Farage and Bannon have been close associates since at least 2012. 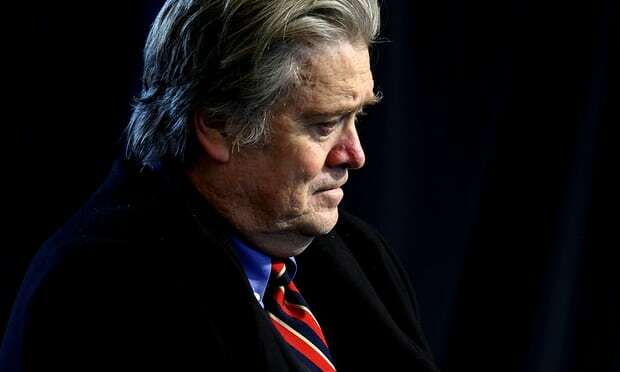 Bannon opened the London arm of his news website Breitbart in 2014 to support Ukip – the latest front “in our current cultural and political war”, he told the New York Times. Britain had always been key to Bannon’s plans, another ex-Cambridge Analytica employee told me on condition of anonymity. It was a crucial part of his strategy for changing the entire world order. On 29 March, the day article 50 was triggered, I called one of the smaller campaigns, Veterans for Britain. Cummings’s strategy was to target people in the last days of the campaign and Vote Leave gave the smaller group £100,000 in the last week. A small number of people they identified as “persuadable” were bombarded with more than a billion ads, the vast majority in the last few days. I asked David Banks, Veterans for Britain’s head of communications, why they spent the money with AggregateIQ. It seems clear to me that David Banks didn’t know there might have been anything untoward about this. He’s a patriotic man who believes in British sovereignty and British values and British laws. I don’t think knew about any overlap with these other campaigns. I can only think that he was played. And that we, the British people, were played. In his blog, Dominic Cummings writes that Brexit came down to “about 600,000 people – just over 1% of registered voters”. It’s not a stretch to believe that a member of the global 1% found a way to influence this crucial 1% of British voters. The referendum was an open goal too tempting a target for US billionaires not to take a clear shot at. Or I should say US billionaires and other interested parties, because in acknowledging the transatlantic links that bind Britain and America, Brexit and Trump, so tightly, we also must acknowledge that Russia is wrapped somewhere in this tight embrace too. For the last month, I’ve been writing about the links between the British right, the Trump administration and the European right. And these links lead to Russia from multiple directions. Between Nigel Farage and Donald Trump and Cambridge Analytica. A map shown to the Observer showing the many places in the world where SCL and Cambridge Analytica have worked includes Russia, Lithuania, Latvia, Ukraine, Iran and Moldova. Multiple Cambridge Analytica sources have revealed other links to Russia, including trips to the country, meetings with executives from Russian state-owned companies, and references by SCL employees to working for Russian entities. Article 50 has been triggered. AggregateIQ is outside British jurisdiction. The Electoral Commission is powerless. And another election, with these same rules, is just a month away. It is not that the authorities don’t know there is cause for concern. The Observer has learned that the Crown Prosecution Service did appoint a special prosecutor to assess whether there was a case for a criminal investigation into whether campaign finance laws were broken. The CPS referred it back to the electoral commission. Someone close to the intelligence select committee tells me that “work is being done” on potential Russian interference in the referendum. Gavin Millar, a QC and expert in electoral law, described the situation as “highly disturbing”. He believes the only way to find the truth would be to hold a public inquiry. But a government would need to call it. A government that has just triggered an election specifically to shore up its power base. An election designed to set us into permanent alignment with Trump’s America. This is Britain in 2017. A Britain that increasingly looks like a “managed” democracy. Paid for a US billionaire. Using military-style technology. Delivered by Facebook. And enabled by us. If we let this referendum result stand, we are giving it our implicit consent. This isn’t about Remain or Leave. It goes far beyond party politics. It’s about the first step into a brave, new, increasingly undemocratic world. : British company with 25 years experience in military “psychological operations” and “election management”. Cambridge Analytica: Data analytics company formed in 2014. Robert Mercer owns 90%. SCL owns 10%. Carried out major digital targeting campaigns for Donald Trump campaign, Ted Cruz’s nomination campaign and multiple other US Republican campaigns – mostly funded by Mercer. Gave Nigel Farage’s Leave.EU “help” during referendum. : US billionaire hedge fund owner who was Trump’s biggest donor. Owns Cambridge Analytica and the IP [intellectual property] ofAggregateIQ. Friend of Farage. Close associate of Steve Bannon. Steve Bannon: Trump’s chief strategist. Vice-president of Cambridge Analytica during referendum period. Friend of Farage. : Director of Cambridge Analytica and SCL Group. Christopher Wylie: Canadian who first brought data expertise and microtargeting to Cambridge Analytica; recruited AggregateIQ. AggregateIQ: Data analytics company based in Victoria, British Columbia, Canada. Worked for Mercer-funded Pacs that supported the Trump campaign. Robert Mercer owns AggregateIQ’s IP. Paid £3.9m by Vote Leave to “micro-target” voters on social media during referendum campaign. Outside British jurisdiction. Veterans for Britain: Given £100,000 by Vote Leave. Spent it with AggregateIQ. : Youth Leave campaign set up by 23-year-old student. Given £625,000 by Vote Leave & £50,000 by another donor. Spent it with AggregateIQ. : Democratic Unionist Party of Northern Ireland. Spent £32,750 with AggregrateIQ. Thomas Borwick: Vote Leave’s chief technology officer. Previously worked with SCL/Cambridge Analytica and AggregateIQ. ASI Data Science: Data science specialists. Links with Cambridge Analytica, including staff moving between the two and holding joint events. Paid £114,000 by Vote Leave. Vote Leave declared £71,000 to Electoral Commission. : US president. Campaign funded by Mercer and run by Bannon. Data services supplied by Cambridge Analytica and AggregrateIQ. Nigel Farage: Former Ukip leader. Leader of Leave.EU. Friend of Trump, Mercer and Bannon. Arron Banks: Bristol businessman. Co-founder of Leave.EU. Owns data company and insurance firm. Single biggest donor to Leave – £7.5m.